I decided to spend this morning and try and figure out how Adobe’s new Flex 2 might change how I develop (or even blog). As I was clicking on links and reading some of the new features, I was surprised to see Mansour Raad and ESRI show up on the Flex 2 page inside a video. If I was ESRI, I’d be putting Mansour on the ESRI front page in a video. He’s so passionate about his work that you can’t help but get excited. 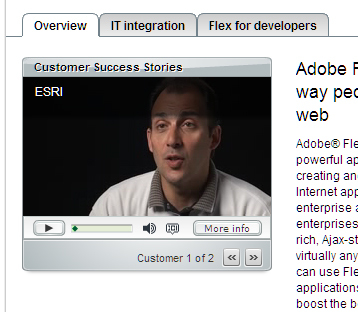 :) When Mansour demoed ArcWeb Explorer to me back at the Dev Summit, I was blown away and I guess Adobe was too. View the full ESRI Flex 2 video here.